After the diagnosis of TMD is established, contributing factors identified and you become familiar with your disorder, all reasonable options of therapy and treatment will be explained. Your options may range from receiving information about avoiding specific activities such as chewing gum or bagels, to alternative therapies such as exercises, behavior modification/biofeedback, counseling, stress management, diet counseling, physical therapy, oral appliances, TMJ injections/arthrocentesis, and surgery. Many severe TMD/Orofacial patients develop symptoms over many years, often starting with mild non-painful clicking of the jaws or tightness in the jaw/head/neck muscles. Because there is no known “cure” for TMD, management of patients with TMD symptoms is similar to management of patients with other orthopedic or rheumatologic disorders. The goals of TMD management include decrease in pain, decrease in adverse pressure or loading on the jaw joints, restoration of function of the jaw and normal daily activities. These goals are best achieved by identifying all contributing factors and implementation of a well defined management program to treat physical and emotional/psychological factors. The management options and sequence of treatment for TMD are consistent with other musculoskeletal disorders found in the body. As in many musculoskeletal conditions, the signs and symptoms of TMD may be temporary and self limiting without serious long term effects. For these reasons, special effort should be made to avoid aggressive or nonreversible therapy such as surgery, extensive dental treatment or orthodontic treatment. Conservative management techniques such as behavior modification, physical therapy, medication, jaw exercise and orthopedic appliances (orthotics) have proven to be safe and effective in the majority of TMD cases. Most patients suffering from TMD achieve good long-term relief with conservative (reversible) therapy. Scientific research demonstrates that over 50% of TMD patients treated with conservative management have few or no ongoing symptoms of TMD. Patient self-care should include: limited jaw opening (yawning, etc.) to no more than 2 fingers widths. Rest of the jaw by avoiding heavy chewing (e.g. gum, bagel, tough meats).· Avoidance of grinding and clenching of teeth by keeping the teeth slightly apart and the jaw relaxed.· Avoidance of leaning or sleeping on the jaw.· Avoidance of playing wind, brass and string instruments that stress, retrude or strain the jaw.· Use of cold/ice packs or moist heat compresses as directed by your doctor or therapist.· Massage the affected muscles.· Gentle range of motion exercise of the jaw as directed by your doctor or therapist.· Use of over-the-counter medications such as Aspirin, Ibuprofen, Naproxen, or Tylenol. Extensive research is being conducted on the safety and effectiveness of TMD/Orofacial pain treatments. Most researchers and clinicians strongly recommend reversible and conservative treatments for TMD. Even when TMD symptoms are long standing and severe, most TMD patients do not require invasive treatment. Treatments designed to permanently change the bite or reposition the jaw with orthodontics or dental reconstruction should be avoided. Specially trained dentists, physical therapists, psychologists and physicians are usually the best source for the proper diagnosis and management of TMD/Orofacial pain. If irreversible treatment for TMD/Orofacial pain is recommended, get a reliable second opinion. Behavioral intervention is often necessary. Maladaptive behavior and persistent habits such as tooth clenching or nail biting may play significant role in aggravating and perpetuating TMD symptoms. Maladaptive behavior and habits may be modified or controlled by patient awareness alone; however, a behavior modification program facilitated by a trained clinician is often necessary for long-term control. Clinical behavior modification programs may include habit reversal programs, life-style counseling, progressive relaxation, autogenic training, hypnosis, and biofeedback. Programs combining comprehensive and biofeedback may yield the best long-term result. Psychological or emotional conflicts can be an integral component in TMD and chronic pain behavior. Referral to a mental health professional such as a psychologist or psychiatrist for psychotherapeutic intervention in conjunction with reversible physical treatment modalities may be indicated for chronic TMD. Non-narcotic analgesic drugs such as Acetaminophen (Tylenol). Non-steroidal anti-inflammatory drugs (NSAIDS) such as Aspirin, Trilisate, Ibuprofen, Naproxen and prescription strength NSAIDS. Muscle relaxant drugs such as Carisoprodol (Soma) and Cyclobenzaprine (Flexeril). Tricyclic anti-depressant medications such as Amitriptyline (Elavil), Nortriptyline (Pamelor), and Doxepin (Sinequan). All medications have specific benefits and side effects. Long term use of medications should be directed and supervised by your dentist or physician to reduce the potential side effects. Medication can be very effective to reduce pain and inflammation. The extended use of narcotic (opioid) medications such as Codeine, Hydrocodone, Propoxyphene, and sedative psychotropic drugs such as Valium, Xanax, and Ativan may lead to depression, drug tolerance and addiction. Use of these medications that often give temporary relief from pain, are discouraged for long-term pain management. Occlusal therapy such as extensive occlusal adjustment (equilibration), orthodontic treatment, restorative dentistry (onlays, crowns or bridges) and orthognathic surgery has little support in the scientific literature for routine use in the treatment of TMD. Several recent scientific studies on occlusion and TMD conclude that treatment of occlusion for TMD is infrequently necessary. Limited occlusal adjustment following stabilization of the TMD symptoms may be beneficial. In general, irreversible occlusal changes should be discouraged. Oral orthopedic appliances are routinely used in TMD management. Oral orthopedic appliances are commonly referred to as occlusal splints, orthotics, night guards or bruxism appliances. Oral orthopedic appliances are usually made from hard acrylic, are removable and cover the upper or lower teeth. Oral orthopedic TMD appliances are designed to redistribute the occlusal forces, prevent wear, reduce mobility of teeth, reduce bruxism/clenching, reduce jaw muscle pain and alter structural relationships within the TMJ. All oral orthopedic appliances should be periodically checked and adjusted by an experienced dentist as the potential exists for harmful changes to the teeth and jaws if improperly used. Complications such as dental caries, gingival inflammation, mouth odors, speech difficulties, tooth movement and psychological dependence on the appliance can occur with excessive or incorrect use of oral orthopedic appliances. Physical therapy performed by a licensed physical therapist is well recognized as an effective and conservative treatment for musculoskeletal disorders such as TMD. Physical therapy aids in identifying and reducing contributing factors to musculoskeletal problems, reduces inflammation, restores function and promotes repair and regeneration of injured tissues. Physical therapy techniques may include spinal-head-jaw and tongue posture training. Exercises prescribed by the physical therapist or doctor are important to maintain normal muscle/joint function and comfort, improve joint range of motion, increase muscle strength, develop normal coordination and stabilize the TMJs. Exercises should be specifically prescribed and monitored by the therapist or doctor as improper or excessive exercise therapy can aggravate TMD symptoms. TMJ mobilization techniques are often indicated for decreased range of motion and pain related to jaw muscle contracture, disc displacement, and adhesion in the joints. Pain reduction and muscle relaxation is usually required before mobilization of the jaws can be achieved. Physical agents or modalities for TMD management include electrotherapy (EGS, TENS, etc. ), ultrasound, anesthetic agents (Vapocoolant spray and topical anesthetic), stretching and massage. 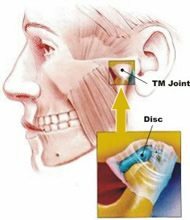 TMJ arthrocentesis consists of anesthetizing the affected TMJ with local anesthetic followed by flushing the joint with a sterile solution such as Lactated Ringers Solution. The effect of TMJ arthrocentesis is to lubricate the joint surfaces and reduce inflammation. Corticosteroids or anti-inflammatory agents can be injected into the joint following arthrocentesis. Gentle manipulation of the jaw is often utilized following arthrocentesis to improve the jaw range of motion and in some cases lysis or break fibrous adhesions that limit normal jaw opening. TMJ surgery can be effective treatment for specific joint disorders. The complexity of surgical techniques, potential for serious complications, frequency of behavioral and psychological contributing factors and the availability of non-surgical approaches make TMJ surgery a procedure that should be used on very select cases. TMJ surgery should only be considered after reasonable reversible treatment techniques have been unsuccessfully utilized. TMJ surgical procedures include closed surgical techniques (arthroscopy) and open surgical techniques (arthrotomy). TMJ arthroscopy may be effective in treating painful joint hypomobility secondary to displaced discs, fibrous adhesions and arthritis. TMJ arthroscopic surgery has significant limitations related to the limited size of the arthroscopic instruments and limited space within the joint. Recent studies suggest that TMJ arthrocentesis (lavage) may be as effective as TMJ arthroscopic surgery. TMJ arthrotomy (open joint surgery) may be required in severe fibrous adhesion removal, anklyosis (bony or fibrous), tumor removal, chronic dislocation, painful non-reducing disc dislocation and severe osteoarthritis that have not been responsive to reversible treatment modalities. TMJ arthrotomy may range from simple removal of adhesions, disc repair or replacement to total joint replacement utilizing cartilage and bone grafts or vitallium metal implants. The TMD patient should be aware that there is no guarantee for successful surgical outcome and should routinely get several opinions prior to accepting TMJ surgery.